Chiropractic and back pain relief go together well. (Plymouth chiropractic services abound to encourage that combo!) When your Plymouth chiropractor mentions anything about being a chiropractor, the other person often starts recounting his or her own story of back pain or leg pain or sciatica or neck pain (or that of a family member)! Your Plymouth chiropractor loves it! Plymouth back pain sufferers are invited to come for Plymouth chiropractic care to get rid of their current back pain and learn ways to avoid future episodes that they can put into action and share with friends and family. One of the biggest tips Atiyeh Chiropractic and Functional Neurology shares is that exercise (the proper type for each individual) works. 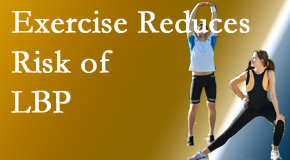 Exercise works to avert low back pain in most adults. The 12,721 patient study (NHANES) compared those who didn’t do any muscle strengthening activity, did it just one day a week, or did it two days weekly. The result: exercising with muscle strengthening activities at least (or rather just) 2 days a week drops the risk of low back pain. (Side note: Smoking impacts this. Recommendation: Do not smoke.) (1) Atiyeh Chiropractic and Functional Neurology recognizes that our Plymouth chiropractic patients can squeeze in a couple times a week for some exercise like this to lessen the hassle of low back pain! Exercise as part of the Plymouth chiropractic treatment plan at Atiyeh Chiropractic and Functional Neurology works for pregnancy-related back pain reduction and prevention. A recent study of findings from 11 studies of 2347 pregnant women shares that exercise reduces the risk of pregnancy-related low back pain. Sick leave due to low back pain during pregnancy is reduced, too. (2) Atiyeh Chiropractic and Functional Neurology knows our Plymouth pregnant patients desire to do what is appropriate for their health as well as their baby’s. Exercise may be agreat self-care/baby-care activity! Exercise works for middle-aged employees. Muscle strength bettered and low back pain decreased over the course of 5 months for employees who did at-home exercises. Trunk muscle strength and low back pain improved in all workers and for those with pre-existing chronic low back pain. Work ability increased, too. (3) Atiyeh Chiropractic and Functional Neurology monitors your strength and back pain improvement at your Plymouth chiropractic appointments. Schedule a Plymouth chiropractic visit with Atiyeh Chiropractic and Functional Neurology for some tips on exercises to help you find improvement of Plymouth back pain and/or avoid Plymouth back pain. Plymouth chiropractic care and Plymouth back pain relief truly go together in Atiyeh Chiropractic and Functional Neurology’s treatment plan.